Hummus is hummus, but roasted cauliflower, along with curry spice, adds a depth of flavor. Double or triple the recipe for a large party. Preheat the oven to 450°F. Line a baking sheet with foil. Pour one tablespoon of olive oil on the sheet, and stir in the curry powder, salt and pepper. Add the cauliflower, and toss in the mixture, making sure all sides are well-coated. Spread the coated cauliflower on the sheet, and roast for 10 minutes or until tender. In a blender or food processor, add the remaining two tablespoons of olive oil, the lemon juice, chickpeas, garlic and cumin, and then the roasted cauliflower. Blend until puréed, about one minute. Spoon the mixture into a serving bowl, cover and store in the refrigerator for up to 24 hours. Makes six servings. 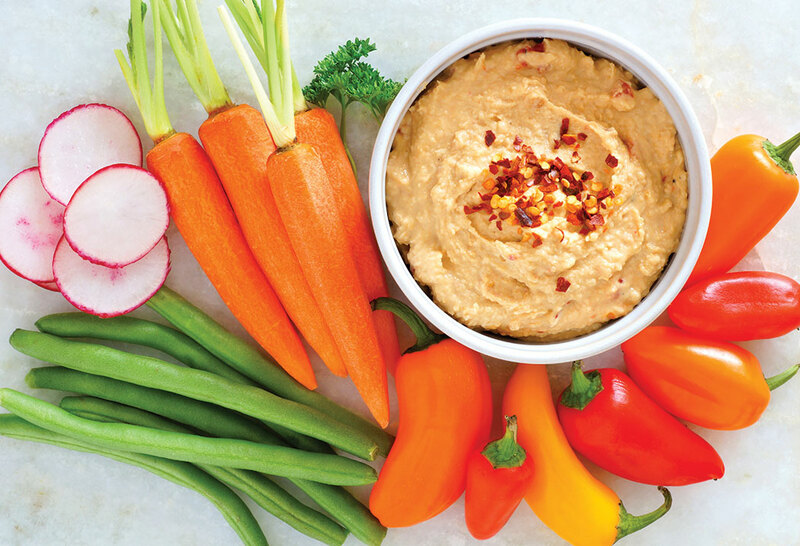 Crudités suggestions: Serve with about 12 cups cut-up vegetables such as ­jicama, fennel, snow peas, celery, carrots, cherry tomatoes and red or green pepper. 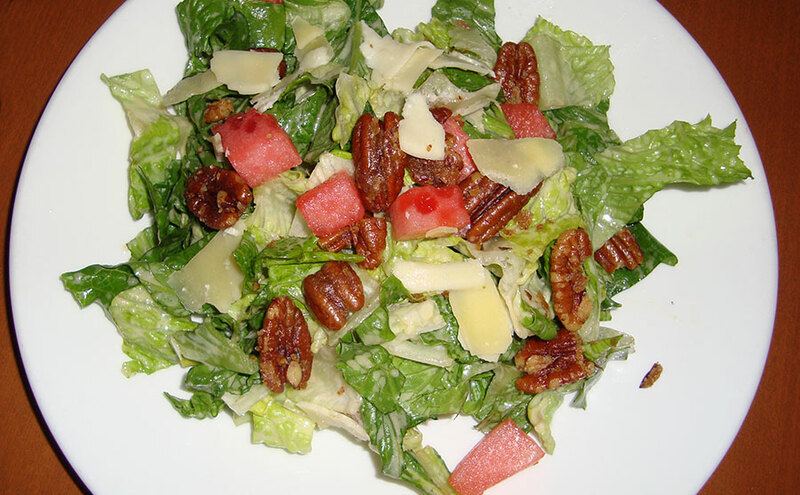 Cool watermelon contrasts deliciously with spicy pecans in this salad. Make the spiced pecans first: Add the butter and brown sugar to a skillet over medium-high heat (remove from the heat if the mixture starts to brown). When the sugar is mostly dissolved, add the ­cayenne, salt and rosemary. Add the pecans, and stir constantly for two minutes. Cool. Store in a covered container. To make the citrus dressing: Blend the lime juice, lemon juice, rice vinegar and mustard in a food processor. With the processor running, add the canola oil. Add salt and pepper to taste. Store and refrigerate in a small, covered serving bowl. Refrigerate until needed. Storing and serving: The dressing and pecans can be made and the lettuce and melon prepped a day ahead, but each should be stored and transported separately. Just before serving, drizzle the salad with the dressing, and sprinkle with pecans. Bring serving tongs or a salad fork and spoon. Makes six servings. 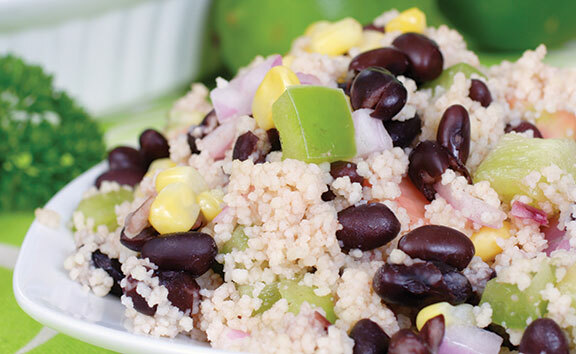 Israeli-style couscous (aka pearl couscous) has a nice firm texture, so it holds up well in a salad. Mint, cilantro and lime make this summer salad refreshing. Bring the water to a boil in a ­medium-sized saucepan. Cook couscous according to package directions and cool. Place in a serving bowl, and add the black beans, mint and cilantro. Toss well. Pour lime juice into a bowl, and whisk in the olive oil. Add the onion, and pour the mixture over the couscous and beans. Toss well. Add salt and pepper to taste. The couscous can be made up to two days ahead. Makes six servings. It’s always fun to have delicious finger foods that you can grab and munch at a party. 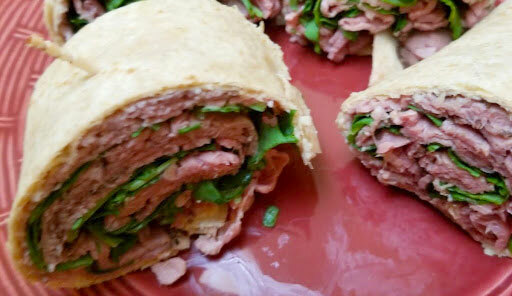 Make these mini-wraps with lean roast beef, horseradish and fresh arugula, and they will go fast. Place the tortillas on a countertop. Mix the mayonnaise and horseradish together, and spread over the ­tortillas. Place one layer of roast beef on the mayonnaise mixture. Place several leaves of arugula over the meat. Add another layer of roast beef and then a layer of arugula. Finish with a layer of roast beef. Tightly roll up the tortillas, and slice each into four portions (about two-and-a-half-inches per portion). Place a toothpick into each. Makes six ­servings. Storing: This is one party recipe you don’t want to make the day before—the tortillas would become mushy. But you can make mini-wraps up to several hours before the party. The sauce is an indulgence, but the fruit is healthful and refreshing. 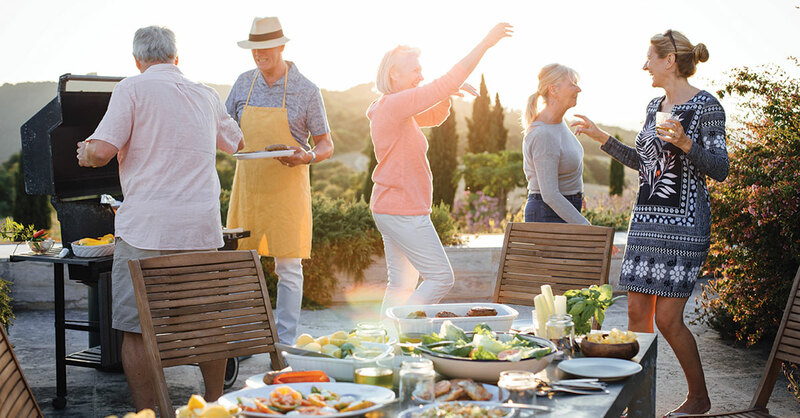 If ripe mangoes aren’t available in your market, substitute cantaloupe for an equally ­delicious treat. To make the sauce: In a saucepan, combine the condensed milk, the 14 ounces of water, evaporated milk and egg yolks. In a small bowl, mix the cornstarch with the remaining three tablespoons of water to form a smooth paste, then add it to the saucepan. Bring the mixture to a boil over medium-high heat, whisking constantly. Cook until it begins to thicken and is difficult to stir. Remove the saucepan from the heat, and stir in the vanilla extract and butter. Pour the sauce into a small bowl, cover and refrigerate until needed. When you are ready to serve, place the mango cubes and blueberries on a flat serving platter with raised sides. Drizzle the sauce onto the fruit, sprinkle with ground cinnamon and serve the remaining sauce on the side. Storing and serving: Mangoes can be cut the day before. The sauce can be made two days ahead. At the party, bring a serving spoon for the fruit and a small bowl and spoon to serve extra sauce. Makes six servings.